An Englishman, Frederick Hobson emigrated to Canada in 1904 after serving in the South African War. 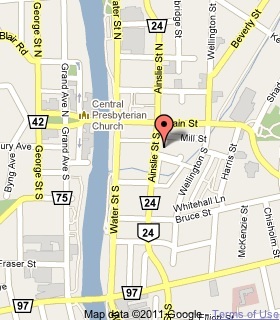 Eight years later, he moved to Galt (now Cambridge) with his family. When war broke out in 1914, he joined the Norfolk Rifles, then enlisted with the 20th Battalion of the Canadian Expeditionary Force. He was awarded a posthumous Victoria Cross for his heroic action at Hill 70, near Lens, France on August 18, 1917. During an intense German counter-attack, Hobson rushed from his trench, reactivated a buried Lewis gun, and engaged the advancing enemy single-handed. When the gun jammed, the wounded Hobson fought with bayonet and rifle until he was shot. In the time gained reinforcements approached to drive the enemy back. My name is Sara Anne Thorn. Sgt. Frederick Hobson is my Great Grandfather. His son George Albert Thorn is my Grandfather. My father is the son of him, Thomas George Thorn. 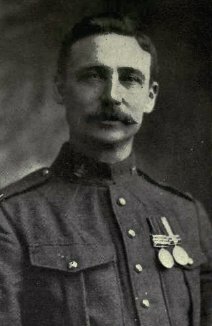 One of the first to enlist in Simcoe for the First World War was Sergeant Frederick Hobson who had been an employee of Canadian Canners. He joined the 39th Regiment (Norfolk Rifles) shortly after war had broken out in 1914 and subsequently was assigned to the 20th Battalion of the Canadian Expeditionary Force. Hobson is the only known Norfolk resident to be awarded the British Empire's highest medal for valour, the Victoria Cross, for attempting to keep back German forces that were advancing toward his battalion in Lens, France, August 18, 1917. Hobson lost his life in this act of supreme bravery. 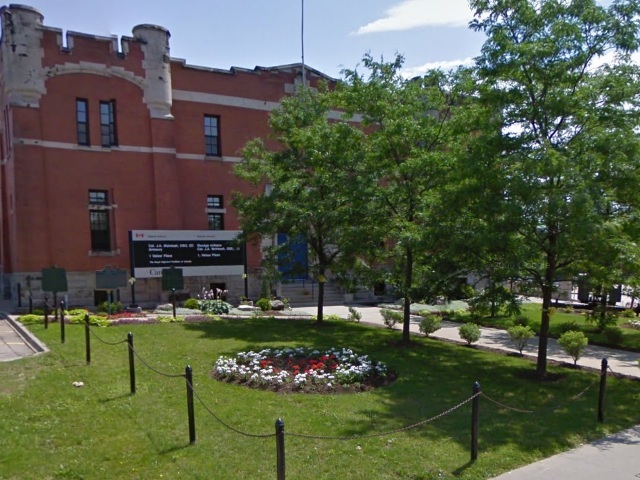 His heroism was recognized in 1992 in the naming of the Armoury, the Sergeant Frederick Hobson V.C. Armoury. In 2001, a more modern armoury facility was built in the Alfred W. Judd Industrial Park (off of Park Road in Simcoe). The name "Sergeant Frederick Hobson V.C. Armoury" was carried forward. 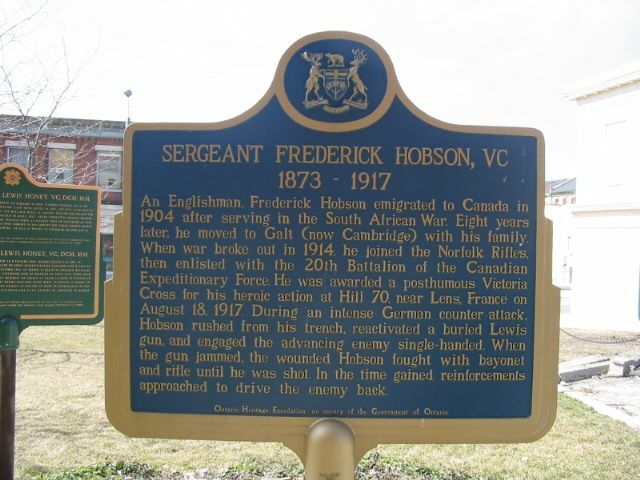 A plaque honouring Sergeant Frederick Hobson V.C. has been put up at 85 Robinson Street. My name is Eric. Frederick Hobson is my Great Great Grandfather. I would like to know more about his history and perhaps military records or files if still in decent condition. Thank you for providing and recognizing his service. Does anyone know if Frederick Hobson had any children. If so can you send me the information. My email is tammypthorn@hotmail.com. Thank you kindly.